Protect yourself from dangerous dogs while cycling, walking, jogging, etc. 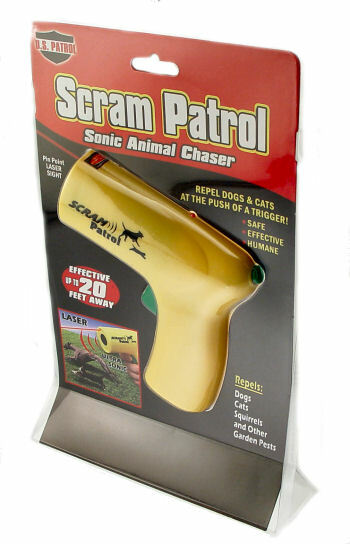 The Sonic Animal Chaser produces a 25 KHz frequency sound that the human ear can not detect yet is extremely discomforting to animals. It is able to repel vicious dogs (can also be used to repel cats, squirrels and other garden pests) without harming them. This animal chaser has an effective range up to 20 feet (about 7 meters) with a prime operating range of 5 to 6 feet. To make sure you are pointing the chaser at the right place it has a built-in laser sight. 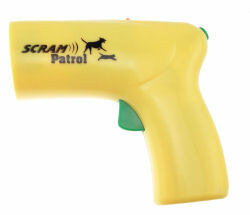 It's even safe enough to use for training dogs and cats. Requires one 9 volt battery that is not included. Measures 4-1/2" x 5" x 1-1/2"